This is our new meeting room in our new building in Kyoto(Uji-City). 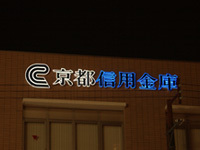 780 pcs of our ASYCK LITE(White:380, Warm:380) are used. This can modulate light 5 steps each color. Total length is 12 meters, Width is 1 meter. 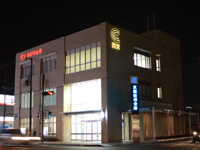 In July,2006 The Kyoto Shinkin Bank Shiga Branch was opened in Shiga Prefecture. These signs use our A'star Light. They change color slowly and can display full color. 1368 pcs of our A'star Light are used.